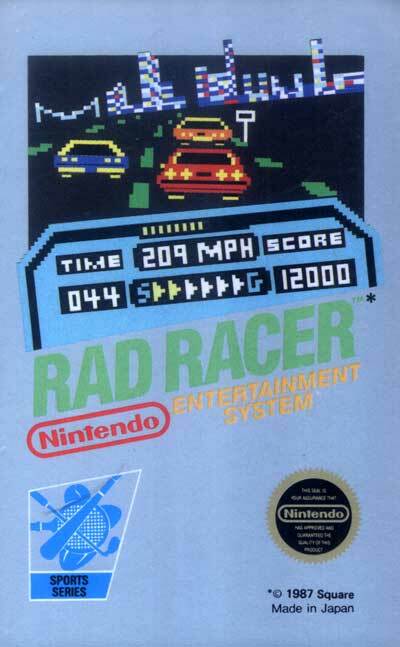 Rad Racer is an arcade style 3-D racing game. The object of the game is to race to the goal within the given time limit. Along each course are several checkpoints which will increase the amount of time you have to reach the final destination. There are eight different stages with increasingly difficult roads, changing weather conditions, and a variety of opponents who tend to get in the way. Included with the game is an optional pair of red-blue 3-D glasses which can be used to give the game an even more 3-D appearance.